The RCA Mark II cost RCA $500,000 to build. It had an additional twenty-four variable oscillators, and took up ten 19" racks. It used a multi-track tape machine to record completed tracks. Both machines used punched paper rolls to program the synthesizer/sequencer in binary code, with four columns of dots for each parameter, giving sixteen possibilities - the first column being worth 1, the next 2, the next 4, and the last 8. There were control sections for Frequency, Octave, Envelope, Timbre, and Volume. The paper roll was 38cm wide and moved at about 10cm/sec - making a maximum bpm of 240. Longer notes were composed of individual holes, but with a mechanism which made the note sustain through till the last hole. Attact times were variable from 1 ms to 2 sec, and decay times from 4 ms to 19 sec. On the Mark II, High and low pass filtering was available, along with noise, glissando, tremelo, and patchable resonance and attenuation sections, both giving millions of possible settings. Charles Wuorinen used it to generate material for his Pulitzer Prize winning "Time's Enconium". 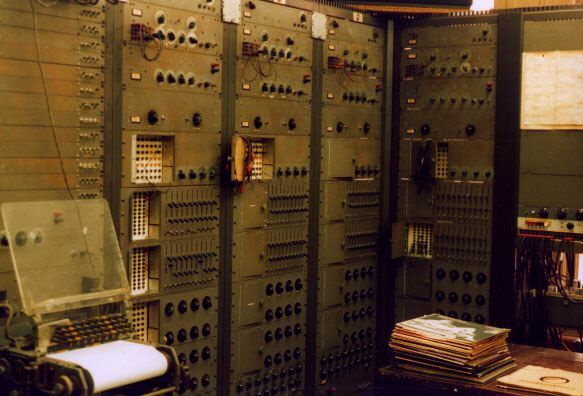 Then, in 1959, the Columbia-Princeton Electronic Music Center aquired the machine from RCA. At Columbia-Princeton, Milton Babbitt used it extensively. His tape and tape and instrument pieces were realized using the RCA Mark II, including his masterpiece 'Philomel', for synthesized sound and soprano.